A Bond Bug by Bandai toys of Japan. A 1970s tinplate & plastic Bond Bug. 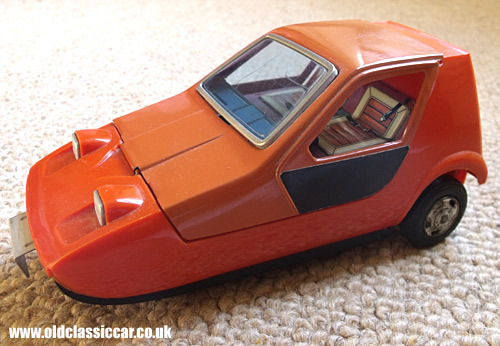 The three-wheeler Bond Bug was introduced in 1970 and produced for four years, which coincides with the era that this Bandai toy version of the bright orange Bond Bug would have been made. It measures 7.25 inches in length, and comprises both tin-plate and plastic parts. 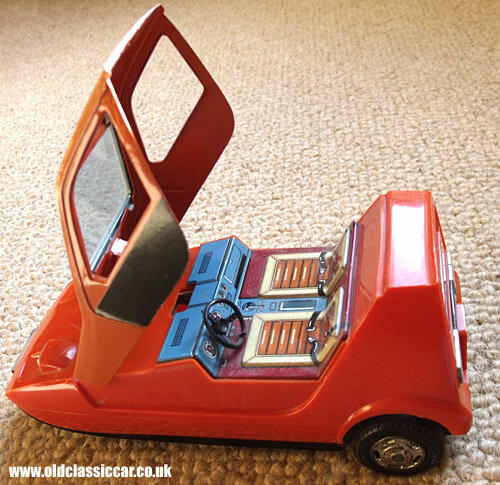 The pop-up roof and lithographed interior are in tin, while the body and chassis are plastic. Judging by the condition of the battery compartment underneath, I don't think this Japanese toy has ever been played with. Apparently it should perform figure-of-eight turns. The front "bumper", when compressed, causes the spring-loaded roof to pop up. 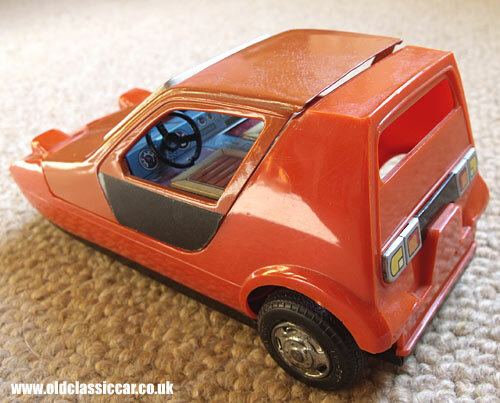 This toy sports the registration number JSC 1K, and represents a LHD Bond Bug. An owner's account of rebuilding a real Bond Bug can be found on this page in the Your Cars section of the site.